Stephen Wills, left, and Jack Beaty, 11, play chess under the watchful eye of Sasha Lokshin, center. The Chattanooga Chess Club meets for a weekly playing session at the downtown YMCA. • The U.S. Chess Federation will mail a free information packet on starting scholastic programs. Mail the request to U.S. Chess, P.O. Box 3967, Crossville, TN 38557 or call 931-787-1234. • The U.S. Chess Trust (www.uschesstrust.org) offers answers to some basic questions and offers assistance with acquiring free chess sets and U.S. Chess Federation memberships. • Hamilton County Scholastic Chess will provide sets for free or at low cost. Contact Larry Grohn at 243-8235 or Lgrohn47@gmail.com. • Chattanooga Chess Club members said they are willing to offer assistance coaching/sponsoring local programs. The club meets 6-9 p.m. Thursdays at the downtown YMCA, 301 W. Sixth St. While the late game is where a match is decided, experienced chess players know that victory is often built on a solid opening. Sponsors of area scholastic chess programs said they hope the debut this fall of two citywide tournaments will be the first step in attracting more young people to the game. 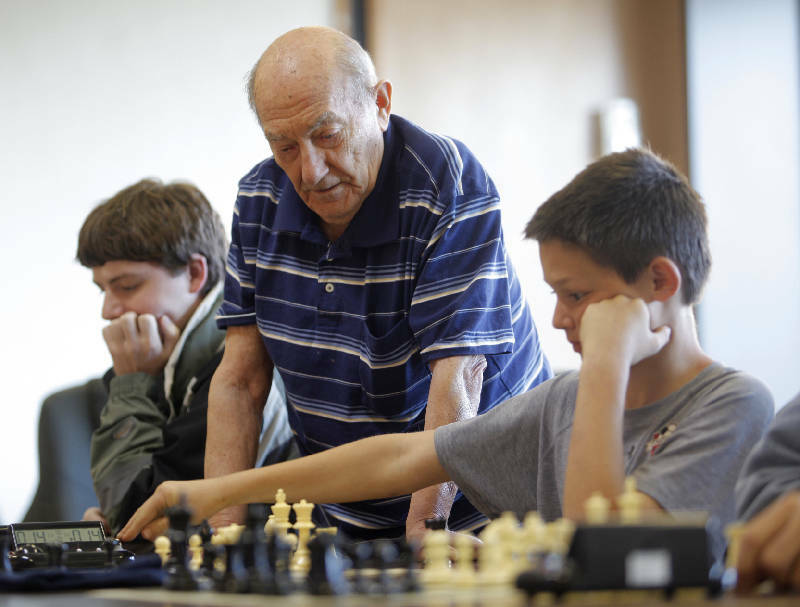 "That's something that needs to be done if we want to build a long-standing, solid base for chess in this area," said Larry Grohn, 64, who has sponsored many area chess programs. "Players will now focus on these tournaments and will start to prepare and practice." The individual and team citywide competitions will be hosted at McCallie School on Oct. 6 and Nov. 10, respectively. Malcolm Estrada, 62, is the president of both the Chattanooga Chess Club and the Tennessee Chess Association. He has worked in coordination with Grohn and other area chess enthusiasts to organize the citywide events. Estrada said the fall tournaments will not only serve students who already play but should help tap a vast potential audience. "I think the students are there, the young people are there, and they're amenable to it, if they're introduced to the game," he said. Playing chess has many positive side effects that last long after the pieces have been packed away, according to a summary of research conducted from the 1970s to the 1990s prepared by Dr. Robert Ferguson Jr., executive director of the American Chess School. A study in Zaire in 1972-73 found that mandatory participation in a scholastic chess program improved teenagers' verbal and mathematical performance on aptitude tests. A Belgian study from the same period concluded that preteens who studied chess developed more mature, analytical thought earlier than their peers. Other projects Ferguson evaluated found links between playing and studying chess and improvements in students' memory and creative and critical thinking. Those benefits come as no surprise to Grohn, who took up the game at age 9. "[Chess] develops young minds so quickly," he said. "Chess makes you critically think about the situation you're in, and the great thing for students is that it makes you think about the consequences of your actions." When he started a second career at age 42 as a teacher, Grohn began sponsoring scholastic chess programs wherever he settled. After he retired four years ago and moved to Chattanooga from Denver, he started a one-man organization, Hamilton County Scholastic Chess, to serve as a resource for those who wanted to found new chess programs. Through HCSC, Grohn has donated used sets to schools in Chattanooga, Ooltewah, Cleveland, Tenn., and Chatsworth, Ga., among other places. He also sponsors the weekly chess club at West Side Elementary School in Rossville. Building a network of new programs is crucial to providing entry points for young chess players, said Michael Ake, the coach of the McCallie School chess team. Ake is also the Region II scholastic coordinator for the Tennessee Chess Association and one of the main organizers of the new tournaments this fall. He and other chess club sponsors said Chattanooga schools would benefit from founding more programs. The main barrier to entry, Ake said, isn't cost but finding someone to serve as a sponsor or coach. That role is often filled by retired players such as Grohn. "It requires a very minimal investment on a school's part to have a successful chess program," Ake said. "It's largely about having a teacher who's willing to sponsor it and to take the time to work with [students]." Chess aficionados said they recognize that interaction between players is crucial to ensuring the survival of school programs. "I saw a lot of interest but no connectors," Grohn said of his first impressions of Chattanooga's scholastic chess community. "We've been trying to bring all these disconnected groups together so the kids can have the experience and can go beyond their own local group." In addition to forging bonds that help maintain the chess community, tournaments also offer players opportunities to get out of their comfort zone by competing against strangers. Until two years ago, the city had only one long-standing annual competition, the Rea Hayes Open Chess Tournament, an all-ages, ranked event that requires membership in the U.S. Chess Federation. Tennessee residents competing in Rea Hayes also are required to be members of the Tennessee Chess Association. Tad Beaty, a TVA senior systems analyst, founded the chess program at The Montessori School and has helped organize the citywide tournaments this year. Last year, he started the Montessori Scholastic Open, an event restricted to students but, because it was unranked, had no membership requirements. When it debuted, the Montessori tournament attracted 10 players. This year's tournament will take place Saturday, and Beaty said he has received as many early registrations as he had participants the first year. By Saturday, he expects to have doubled or even tripled his pool of competitors over last year. That indicates a degree of interest in competitive play that should be served even further by the citywide events this fall, he said. "I think it will be starting to change," Beaty said. "There's a lot to build on." • When: Saturday, first round at 9 a.m.
• Where: The Montessori School, 301 Montessori Way. • Age restriction: Open to all grade school players. • Specifications: Unrated. No memberships required. • When: June 2, first round at 9 a.m.
• Where: Bethel Bible Village, 3001 Hamill Road. • Entry fee: $20 for the rating-limited reserve section; $25 for the open section. • Age restriction: Open to players of all ages. • Specifications: Unrated. All players must be U.S. Chess Federation members. Tennessee residents must also be Tennessee Chess Association members. • When: Oct. 6, first round at 9 a.m.
• Where: McCallie School, 500 Dodds Ave.
• Entry fee: $10 advance registration until Oct. 2; $20 on-site. • Age restriction: Open to all grade-school players from Tennessee, Georgia, Alabama, Kentucky and the Carolinas. • When: Nov. 10, first round at 9 a.m.
• Entry fee: $50 per four-person team plus one alternate, must be received by Nov. 1. No on-site registration. • Age restriction: Open to all scholastic teams from Tennessee, Georgia, Alabama, Kentucky and the Carolinas. 600-1000 -- Chess originates in India in 600-1000 CE as the game chatarung and is spread by Persian traders to Europe. Chatarung's most valuable piece is called the ferz, a male counselor to the king. Late 1400s -- Pieces' move sets change. The formerly weak queen replaces the ferz as the dominant piece, and the bishop is able to move across the board. 1750 -- Chess aficionado and statesman Benjamin Franklin publishes "On the Morals of Chess," an essay on the benefits of chess. 1845 -- The first U.S. chess championship is held. 1924 -- An unsuccessful attempt is made to include chess in the Olympic Games, leading to the founding of the international Chess Olympiad, which is held in 1927 in Paris. 1937 -- The first U.S. women's championship is held. 1957 -- Bobby Fischer becomes the youngest ever U.S. champion at the age of 14. 1997 -- IBM's Deep Blue makes history by being the first computer to beat a world chess champion, Garry Kasparov. 2002 -- Inspired by Kasparov's loss, computer engineer Omar Syed devises rules for arimaa, a game played using chess pieces and designed to be more difficult for computers to excel at.